No food works more perfectly as a backyard barbecue snack, as an elegant dinner party app, or even as a special dessert, than cheese. It’s all about how you serve it. And now Cabot’s resident chef has you covered with smart tips and recipes. Jimmy Kennedy is building a tiny village of houses crafted from cheese. His 6-year-old daughter hands him a roof piece: a Cabot Pepper Jack Cheese Cracker Cut. Biting into a wall—this one made of Seriously Sharp Cheddar—Kennedy makes a door. “They’re very fun to work with!” Kennedy exclaims, pointing to the farmer owned cooperative’s latest product, Cabot Cracker Cuts. 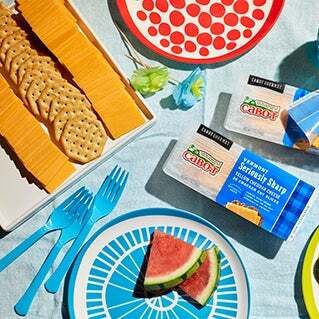 In six flavors, they come in handy resealable packages of 26 pre-cut slices, perfect, as Kennedy has learned, for cooking with — or even building with. As Cabot’s resident chef, Kennedy travels the country with the Farmers’ Gratitude Grille to serve free meals to volunteers, like those at Boston Cares, who are giving their time to better their communities. 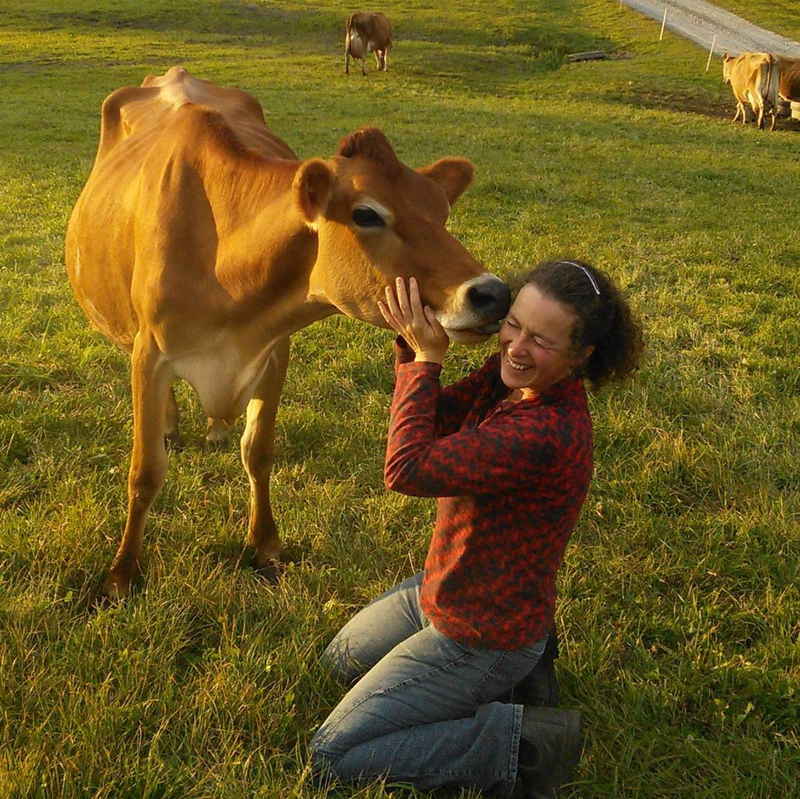 It is part of the Cabot farmers’ commitment to thanking, recognizing, and rewarding volunteers through the cooperative’s Gratitude Department. When Jimmy is off the road, his focus is on recipe development. His family often serves as his test subjects and helpers, recently cooking them tacos and grilled cheese sandwiches using the cracker cuts. Kennedy has also been developing recipes for Cabot’s Legacy Collection, a series of four premium aged cheddars. 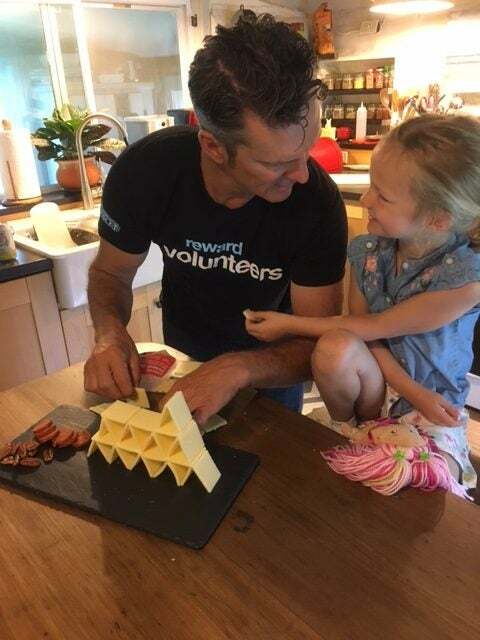 The creative dad and chef has been dreaming up ways to use cheddar for years, from fun to fancy. Every good party needs a good cheese board, but why should the host do all the work? Kennedy likes to stir up a little friendly competition, especially when guests may not know each other, and could use a little ice breaker. He recommends setting out small cheese boards, with assorted cheeses, crackers, and some good pepperoni. There is room to improvise here, so include whatever you enjoy on a cheese board. Then he starts a timer and has his guests race to build the best board. Naturally, the party host serves as judge. With two young daughters, Kennedy knows the kids need some entertainment at summer get-togethers. When setting up your kids table, he recommends laying out the cheese alongside apple slices, crackers and other healthy snacks. “I would build a little camping scene with the Cracker Cuts or a box or something like that,” he says. Encourage construction and see what the kids will come up with. CHEESEBURGER? YES, PLEASE. WHAT KIND? ALL OF THEM! 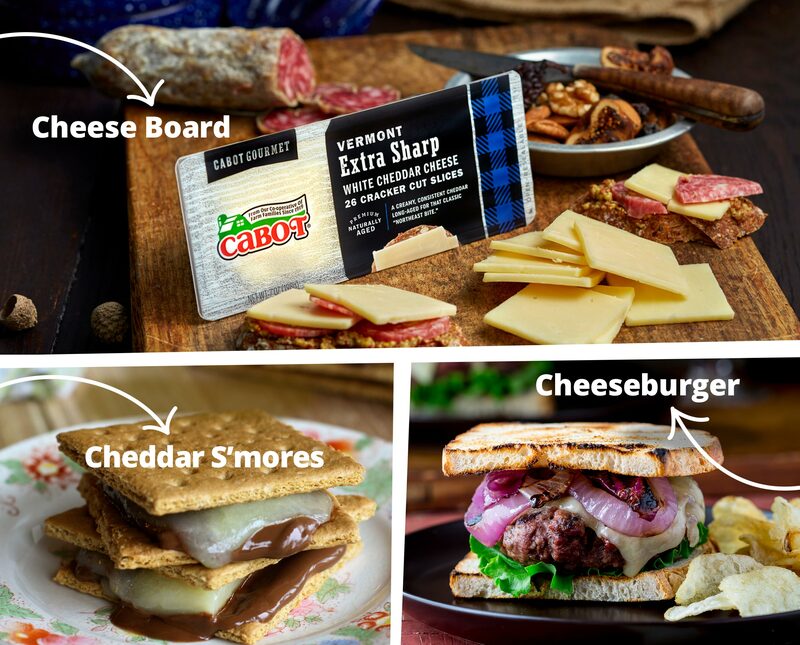 The Cracker Cuts are the perfect size for topping your burgers, chicken, steak, or whatever else you’re grilling. Kennedy thinks two are the perfect amount, and he loves the Pepper Jack Cracker Cuts as a burger topping. But with six flavors, you can have fun mixing and matching to load on the cheese. S’MORES. WITH A CHEESY TWIST. 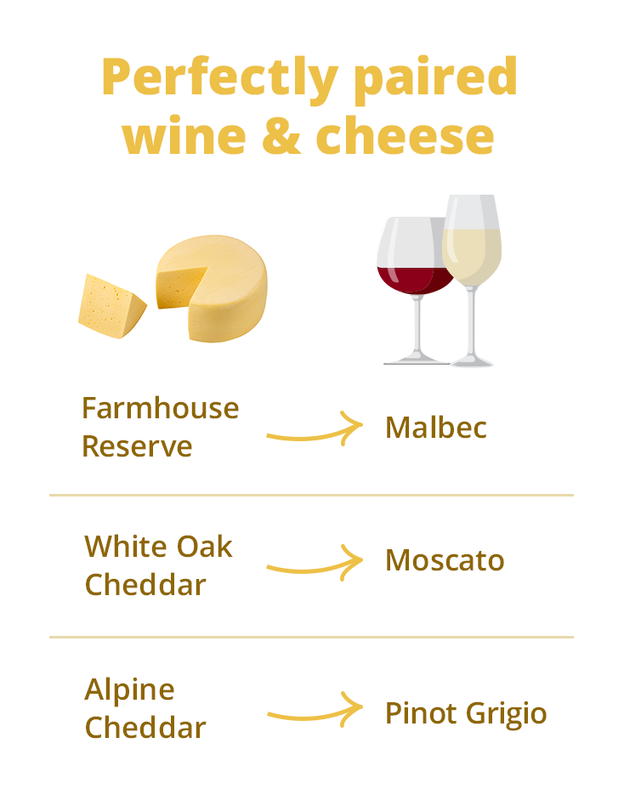 Get the guests involved with a wine and cheese pairing game. Kennedy suggests having four bottles of wine on hand with all four of Cabot’s Legacy Collection cheeses. Give guests note pads and pens; have everyone sample the wines and cheeses, write their tasting notes, and then their preferred pairings. There is no right or wrong answer, and like the best games, everyone wins. 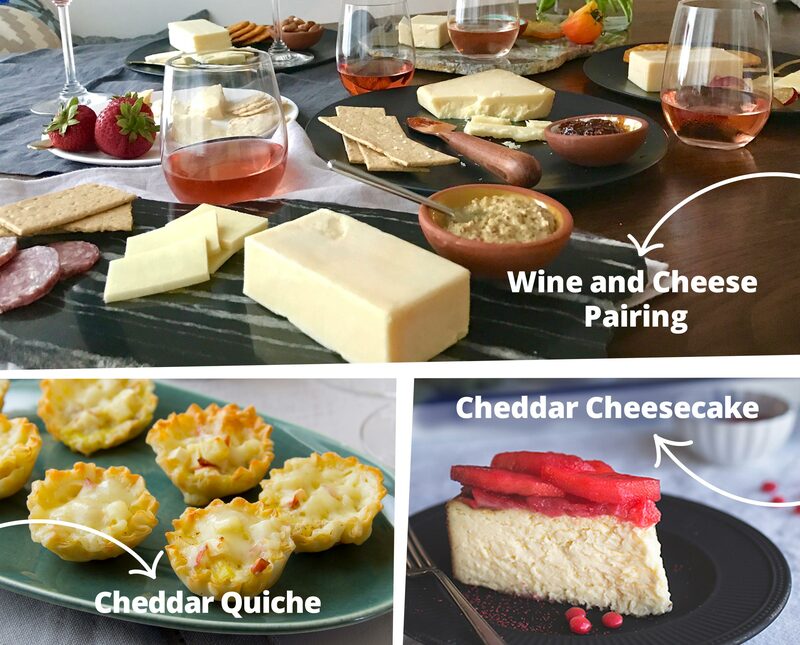 Pairing suggestions: Try these wine and cheese combinations, or if you’re crowd is more into beer, these beer and cheese pairings. Popular Vermont chef and blogger, Katie Webster, has a simple and elegant hors d’oeuvre recipe for the Farmhouse Reserve Cheddar: Mini Filo Quiches. And who doesn’t love a bite-sized appetizer? WHEN ALL ELSE FAILS . . . CHEESECAKE!